HP LaserJet P3015 mono laser printer is suitable for small to medium-sized offices, offering high-quality output and supports built-in ethernet connectivity to share the resources over a network. Some users might find the printer expensive as it lacks some important qualities. It supports high capacity HP LaserJet P3015 toner cartridge, that is capable of producing up to 12,500 pages at a low cost-per-print. The device weighs approx. 35.05 lbs measuring 16.2 x 17.6 x 12.4 inches. It has a boxy look with large footprints. It has a small control panel with 2.25 inch LCD display screen along with four line display followed by 18 characters per line. It has a standard 128 MB of RAM running on a 540 MHz processor. It has an integrated sheetfed document finisher and a USB host 2.0. The HP LaserJet P3015 can print high-quality text and monochrome graphics with print speed up to 42 ppm having a resolution up to 1,200 x 1,200 dpi. The 128 MB of RAM is expandable up to 640 MB. The device has one multipurpose tray capable of storing up to 100 sheets and supports printing on different media such as envelopes, transparencies, labels, plain paper and cards. It has a 500 sheet input tray and an output tray that can handle up to 250 sheets, while the other output bin at the back can handle up to 100 sheets. The HP LaserJet P3015 printer is good for small offices as it delivers reliable and speedy outputs for demanding jobs. The printer might not be the right choice for large workgroups as it lacks various important functions such as scan, copy, fax, mobile printing, automatic duplexing and ADF support. However, it’s high-quality printouts and expandable RAM allows it to best suit for small offices or home users. How to correct the problem of light printouts? 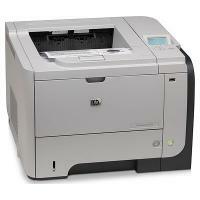 Hp Laserjet P3015 can work well in an office as well as at home. A set of HP Laserjet P3015 toner cartridges is shipped along with it. However, at times you will notice that the print quality has considerably decreased and the printer is producing light prints or no prints at all. These image defects can be corrected by following some easy steps to check the root of the problem and resolving it. Take another print out and see if there is any change in the print quality. Take the HP Laserjet P3015 toner cartridge out of the printer and gently shake it a bit. This will redistribute the toner within the cartridge. See that the cartridge is properly installed. If the problem persists, then take a print of the Supply status page to check for the usage of the toner cartridge. If the cartridge needs replacement then do so. Such print quality problems arise when the toner cartridges that are being used are not compatible with the printer or are of low quality. The company recommends that you use the HP Laserjet P3015 toner cartridges for the printer else the print quality problems will arise. Replace the cartridge with a premium quality toner cartridge. Check if the cartridge is properly and correctly installed. Try printing using a new cartridge. You should also check the paper quality of the sheets placed in the paper tray. Change the settings in the printer software of your system according to the paper quality that is being used. If you are using lighter paper then change the settings as per requirement. A. You can install the printer drivers on your computer by using the CD-ROM that you received with the printer. If you no longer have the CD-ROM, you can also download the printer drivers from here. Q. How many pages can your compatible HP Laserjet P3015 toner cartridges print without having to be replaced? A. Our compatible HP Laserjet P3015 toner cartridges are high yielding cartridges. They can print up to 13,000 pages without replacement so, you do not have to worry about replacing your cartridges frequently. Q. Can the use of your compatible HP Laserjet P3015 toner cartridges cause any damage to my printer? A. Absolutely not! Our compatible HP Laserjet P3015 toner cartridges are of high quality that have been factory tested and certified. They are designed to suit your printer without any hassle. You do not need to be worried about any damage caused to your printer while using our compatible toner cartridges. A. HP Laserjet P3015 printer is a heavy duty printer with a monthly duty cycle of 12,500 pages and has a high print speed of 42 pages per minute. Its crisp text quality makes it perfect for small or medium sized offices. However, this printer is only capable of printing black and white copies and does not come with a built-in Wi-Fi feature which does not make it suitable for home purposes. Q. How long would it take for HP Laserjet P3015 toner cartridges to be delivered to me in Dublin? A. If you place an order for any of our products before 12 noon, the product will be delivered to you within 1 - 2 days. If your order is urgent and you require the product faster than the standard delivery time, you can contact us on 048 308332211 and we will try our best to deliver the product to you as fast as possible. Q. What is the use of Economode? How it turns out to be useful? A. EconoMode is a feature that enables the item to utilize less toner per page. Selecting this option extends the life of the toner supply and might reduce the cost per page. However, it also reduces the print quality. The printed page is adequate for printing drafts. HP does not recommend the full-time utilization of EconoMode. If it is used for full-time, the toner supply might outlast the mechanical parts of the print cartridge. If print quality begins to degrade under these circumstances, you will need to install a new HP Laserjet P3015 toner cartridges, even if there is toner supply remaining in the cartridge. Q. What should I do, if vertical lines appear on the printout? How might I settle them? A. If sharp black vertical streaks appear on the page, the photosensitive drum inside the HP Laserjet P3015 toner cartridges has probably been scratched out. Supplant the toner cartridges at the earliest opportunity. If smeared black vertical streaks appear, the fuser may be bad. Inspect the rollers for scratches and excessive wear, if necessary. Replace the fusing assembly referring the user manual. Q. I recently tried printing a document and found that the toner smears as I print from HP Laserjet P3015 printer. What could be the issue and how can I resolve this? A. If toner smear appears on the leading edge of the paper, the paper guides may found dirty. Clean the printer as described in the user manual. If the toner on the paper is loose or can be wiped off easily, your fuser may be damaged. Call service representative for help. Q. Do you offer any guarantee on HP Laserjet P3015 toner cartridges? Q. I require a little help with my HP Laserjet P3015 printer. I have tried printing using the USB cable but it is not happening. I’m not sure if the problem is with the USB cable or the printer. How can it be solved? A. The printers come with a security setting. If the security setting of your machine has been disabled then you will not be able to print using the USB cable. The settings block printing through the USB cable. You will have to change the settings in order to be able to print. To do so, you have to open the control panel of your printer. Here you will find an Information page. If the Direct Ports (USB/IEEE 1284) option shows Disabled then you have to go to Security tab present in Embedded Web Server and select Configure Security Settings. You can access the EWS by typing the IP address of your printer in a web browser. Here under he Configure Security Settings option, click on Configure. Uncheck the Disable Direct Ports option. Select Apply to apply these changes to your machine. Q. Every time I print an image using the HP Laserjet P3015 printer, I see shadows of the image printer below it three or four times. These shadows fade with every repetition. Does this point to a depleting HP Laserjet P3015 toner cartridge? How should I correct this error? A. No these problems don’t really occur due to the HP Laserjet P3015 toner cartridges. The Fuser defects can occur at times. To solve it you can simply re print the image. If the same issue occurs then check the type of paper that you have put in the paper tray. Match the settings in the printer software. You can also try printing on a lighter paper than the one you are using presently. Q. The images printed from Hp Laserjet P3015 printer show light vertical streaks. Should I replace the HP Laserjet P3015 toner cartridge? A. The light streaks may occur when you print images etc. It happens due to temperature and humidity differences in comparison to the specified range. It will not occur in text documents. This does not point to the replacement of the HP Laserjet P3015 toner cartridge. You may begin by taking another print of the document. If you still see the problem the open the lid of the printer and carefully take the HP Laserjet P3015 toner cartridge out. Now shake it a bit. Doing so will distribute the tone evenly. Take another test print to check. The print quality will be fine now. Q. I keep on seeing ink marks on the printed pages. Is there a problem with the HP Laserjet P3015 toner cartridges? How can I correct it? A. This problem happens due to paper jams. You first need to check where the jam is. If you are not able to identify the source you can check in the Tray 1 and 2, top cover and fuser area. To check for jams in the top cover, you need to open the top cover of your machine and remove the toner cartridge. You will see the jammed paper. Gently pull out the paper. For paper jams in toner areas and rear door, open the rear door and push it down. Keep it at 90 degrees. You will be able to see the paper that is jammed. Pull it out carefully. Once you have cleared the jam, you can take a test print to check if the problem has been corrected.